Our people combine a passion for your business with the expertise learned from working with others. This innovative approach allows us to continually provide meaningful technical advice, smart new applications, and insightful lubricant analysis to keep your equipment performing. Discover some of our experts and their tips. A technical advisor for American Northeast, Gary has worked for Shell for over 15 years in technical solutions and sales support. Greg leads the technical team for the Eastern region of the US, providing troubleshooting, recommendations and support. A Technical Advisor with a background in Aircraft Engineering, Scott has worked for Shell Canada for over a decade. As Regional OEM Manager for the Asia-Pacific area, Siva works closely with all the major OEMs in the region. Praveen leads our technical team in India and has been responsible for establishing the Shell Technology Leadership division. The Transport Technical Advisor for North America, Cornelius has over 21 years’ experience across Lubricants and Upstream Oil & Gas. Gregory Paluska, Technical Team Lead for the Eastern US region, speaks about his role in the Shell Lubricants team. In my line of work, every day is different, but that’s the challenge I enjoy the most. The people, the parts, the problems – especially the solutions – each one unique, yet all of them important. Mid-view footage of Gregory against a black background, speaking into the camera. Close-up of tree branches with a house’s roof in the background. Footage of Gregory opening his front door, walking out to his vehicle, getting in with his briefcase, and driving. Close-up of Gregory against the black background. As a Shell lube expert, I’m a part of a team and it’s our job to keep your equipment running at its best and reduce the risk of failure really in two ways. First, better lubrication practices, and second, specialized onsite tech support. Footage of a barista preparing two takeaway coffees and handing it over the counter to Gregory. Footage of Gregory driving a red truck, pulling onto a lot, and lifting both coffees out of the takeaway holder. A man walks towards Gregory as he gets out of his vehicle – both are wearing safety gear and helmets; Gregory hands the second man a coffee and they shake hands before walking off together at frame left. Footage of earthmoving vehicles at a site, a payloader dumping stone onto a dump truck. This means getting to know you and your operations. Mid-view footage of Gregory against a black background, speaking into the camera. I take as much pride in knowing the ins and outs of your fixed plant or mobile equipment as I do in knowing you personally. Footage of Gregory and the second man seated together at a table in an office environment, drinking their coffees and engaged in discussion. Mid-view footage of Gregory against a black background, speaking into the camera. I’m here to help you reduce downtime in operating costs by improving both your operational efficiency and your equipment’s lifespan. After all, when your equipment performs the way you need it to, it makes you look good. More footage of the earthmoving vehicles fulfilling their functions at the site. More footage of Gregory and the second man seated together at the table in the office environment, drinking their coffees and engaged in discussion, including a close-up of Gregory’s Shell-branded safety helmet resting on the table. Close-up of Gregory against the black background. Taking lubricants off your to-do list and giving you more time to focus on making a difference. More footage of the earthmoving vehicles moving about the site, transporting the stone. And it makes me feel good knowing I had at least a small part in it. Mid-view footage of Gregory against the black background, speaking into the camera. My job is to build relationships and help you improve our operations. More footage of Gregory and the second man seated together at the table in the office environment, engaged in discussion and laughing together while enjoying their coffee. Close-up of Gregory against the black background. Extreme close-up of a laughing Gregory, against the black background. Zooming satellite imagery of the earth. Neryungry, Siberia, possibly one of the most extreme working environments on earth. Red crossing lines and a location point pinpoint the location of Neryungry on the satellite image of the earth, before zooming into the location point. Operating here requires advanced and reliable protection. Miscellaneous footage of the misty Neryungry site, showing excavation vehicles and workmen on site. Low angle footage of a lamp burning against a snowy night sky. Miscellaneous footage of the site, showing mist rising from the earth in the early morning and an excavation vehicle on site against a pale grey morning sky. Close-up of a crane arm moving over the site. This is what Shell Lubricants, including Shell Gadus greases can deliver. Point of view footage as from the cab of the excavation vehicle, as it moves over the site. Low angle close-up of a mechanical arm rising against the pale sky. More footage of excavation vehicles onsite, the figures of workers in the foreground. 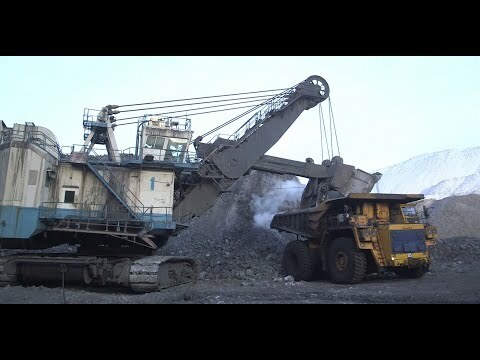 We are part of mining division of Mechel which is known as Mechel Mining. We work around the clock. We don’t have weekends or national holidays. Close-up of Evgeny onsite, speaking to the off-camera interviewer. Bird’s eye view of excavation vehicles moving about the snow-covered site. Workers seated at workstations, facing screens displaying data and graphics, one screen displaying footage of the site. Footage of excavation vehicles working and moving onsite by night, as well as workers involved in various activities by night, and into early morning. The correct choice of lubricants is very important for us, especially if you take our climate conditions into account. Close-up of Valery speaking to the off-camera interviewer. Bird’s eye view of a snow-covered landscape, snow still falling. Footage of an excavation vehicle working on the snow-covered site, workers also visible onsite. It’s very warm, even very hot, here during the summer months, the temperature goes as high as +40°C, and in winter it’s very cold, the temperature can reach -50°C. That’s why we pay so much attention to the quality of our lubricants. We try to choose partners only from those companies that pay particular attention to our requirements. We’re working together with Shell. It’s a very close co-operation. Experts from Shell are visiting us all the time in summer and in winter, and in spring and in autumn. They come to see how we lubricate our machinery and how well the lubricants fit for different seasons. Most importantly they respond to all our requirements very promptly. Footage of excavation vehicles working and moving onsite, as well as workers involved in various activities. Close-up of Evgeny onsite, speaking to the off-camera interviewer. Footage of driving snow onsite. More footage of excavation vehicles working and moving to and fro onsite. Close-up of Evgeny onsite, speaking to the off-camera interviewer. Footage of a group of men walking together in an indoor plant setting, engaged in discussion. Close-up of Evgeny onsite, speaking to the off-camera interviewer. Footage of driving snow onsite. Footage of a dump truck onsite on a clear day, workers also visible onsite. More footage of the excavation vehicle and other vehicles on a snow-covered site, workers also visible onsite. Close-up of Evgeny onsite, speaking to the off-camera interviewer. Footage of workers in the darkened indoor plant setting, engaged in various activities. Our clients, Mechel Mining in this instance, treat us with trust, they believe in us. This is because the solutions that we offer provide them with tangible commercial benefits as well as reliable and long-term operation of the machinery. Close-up of Alexander Charomsky speaking to the off-camera interviewer against the background of the indoor plant facility. Footage of Alexander and other workers in the darkened indoor plant setting, engaged in discussion and various activities. Close-up of Alexander Charomsky speaking to the off-camera interviewer against the background of the indoor plant facility. Footage of smartly dressed people gathered in a meeting room and engaged in discussion, charts visible on the wall behind them. Mid-view of a smiling man seated at a workstation. We, Shell employees feel confident that our products, Shell Gadus greases, will allow mining companies and Yakutugol (MECHEL) in achieving all their goals and to operate their machinery seamlessly. More footage onsite, the vehicles moving about the site. Mid-view footage of Dmitry onsite, speaking to the off-camera interviewer. Close-up of a barrel of Gadus grease with pump and pressure gauge. Mid-view footage of men seated at workstations in an office environment, one speaking on a telephone, others engaged in discussion, computer screens visible in the background. Wide landscape footage of a snow-covered landscape, a vehicle moving through the hills in the distance. We are located far away from the main centres of industrial development. This causes difficulties with timely deliveries of machinery, materials and spare parts for maintenance. Mid-view footage of Sergey Belikov, speaking to the off-camera interviewer in an office setting. Aerial footage of a train moving through a snow-covered landscape. Footage of an urban snowscape, cars parked along a road beside a multilevel building. Footage of another multilevel building beside a road, everything blanketed in snow. I believe that Shell has advantages over other companies and these are definitely their quality and their good logistic support. Close-up of Sergey Kuzmenko speaking to the off-camera interviewer, seated in an office environment. Footage of a pallet of barrels moving onto a conveyor belt, cutting to fast motion footage of a forklift lifting and moving away with the loaded pallet. Bird’s eye footage of an industrial plant, rows of barrels of oil on the paved area outside the factory buildings, panning as a truck leaves the facility. Shell organizes regular, technical seminars and training for our people. We are very happy with this, and we think that this work is organized and done very well. Miscellaneous footage of groups of people gathered in meeting rooms, engaged in discussion. Mid-view footage of Sergey Belikov, speaking to the off-camera interviewer in an office setting. Footage of Sergey Belikov and a group of men gathered around a laptop screen in a meeting room, engaged in discussion. In future we plan to use one single grease, perhaps Shell Gadus S4, depending on field tests, in a wider range of mining machinery, not only in excavators, perhaps in trucks too. Mid-view footage of Dmitry onsite, speaking to the off-camera interviewer. Close-up of a pressure gauge. Close-up of a barrel of Gadus grease. Aerial footage of barrels of lubricant resting in a cage, being moved over the site. Footage of excavation machinery onsite. Mid-view footage of Dmitry onsite, speaking to the off-camera interviewer. More footage of excavation vehicles onsite on a clear day. In the future I see that we will continue working with Shell, and I recommend this company. Close-up of Evgeny onsite, speaking to the off-camera interviewer. We began our rewarding cooperation with Shell a long time ago. We are using Shell lubricants which definitely help us to maintain our machinery in good condition. Footage of two men shaking hands in the indoor plant setting. Close-up of Valery speaking to the off-camera interviewer. Close-up of a crane arm moving over the site. The 10 years that we have worked together with Shell allows us to conclude that their lubricants, their service and their general approach to resolving issues is in my opinion of the highest level and could be used as an example for other companies. Hazy footage of excavation vehicles onsite. Mid-view footage of Sergey Belikov, speaking to the off-camera interviewer in an office setting. Mid-view footage of two men onsite, engaged in discussion. More footage of a group of men engaged in discussion in the indoor plant setting. Mid-view footage of men seated at workstations in an office environment. Close-up footage of a group of men with their heads together, engaged in discussion. Mid-view footage of Sergey Belikov, speaking to the off-camera interviewer in an office setting. Shell Pecten centred against a white background, text displaying below. Shell’s work with China Railway on the Xi’an subway. Beginning with strings and switching to dramatic instrumental music. Close-up still shot of Tianlong at frame right, blending into cityscape footage at extreme frame right. Text displays at frame left. Close-up still shot of Tianlong at frame right, blending into more cityscape footage at extreme frame right. Text displays at frame left. In Xi’an, there are about 2.4 million cars right now. Bird’s eye view of a busy highway, with a bridge overhead. Bird’s eye view of another bridge crossing a waterway, vehicles and pedestrians moving across the bridge, a second bridge in the background. Traffic congestion causes gas emissions. Everyone knows that the smog problem is very serious. Night-time footage of busy city traffic, buildings flanking the roads on all sides. In 2011, Shell began working with China Railway on the construction of its first subway. Close-up of a tunnel boring machine breaking through a wall of stone. Close-up of Tianlong speaking to the off-screen interviewer, seen against an out-of-focus interior background. Footage from within the subway tunnel site, workers engaged in activity around the tunnel boring machine in the background. To ensure a prompt delivery, high quality and smooth operations, experts from Shell and China Railway chose to use Shell Lubricants. Close-up of the face of the tunnel boring machine, construction workers welding at frame-left. Miscellaneous footage of workers, wearing safety gear, engaged in activities in the laboratory. Close-up of flasks of lubricant moving through a machine, and a close-up of lubricant being poured into a flask. In 2015, the temperature in Xi’an dropped rapidly from over 10°C to below zero. Extreme wide bird’s eye view of a busy city street, and tall buildings forming the skyline of the city. Aerial footage of traffic moving along city streets, either side of a building. More bird’s eye footage of traffic moving on a city street flanked with tall buildings. This had a great impact on the progress of our construction. Close-up of Wu Long, wearing safety gear, speaking to the off-screen interviewer, seen against the out-of-focus background of the subway tunnel site. We developed a method for working in cold temperatures in order to achieve more reliable operations and maintenance, ensuring subway construction equipment works efficiently and continuously. Footage from various angles of Wu Long and a colleague, both wearing safety gear, holding drawing plans, and engaged in discussion, all against the background of the subway tunnel site. Close-up of Tianlong speaking to the off-screen interviewer, seen against an out-of-focus interior background. Tianlong and his team were always quick to provide us with great technical support. Footage from within the subway tunnel construction site, Wu Long and his colleague approaching from a distance. More footage of Wu Long and his colleague engaged in discussion at the subway tunnel site, as previously described. They sent over a team of experts, technical staff and their oil product analyst to ensure the smooth running of the equipment in cold temperatures. Close-up of Wu Long, wearing safety gear, speaking to the off-screen interviewer, seen against the out-of-focus background of the subway tunnel site. More footage from within the subway tunnel site, the expert team working together on the task at hand. Close-up of Wu Long, wearing safety gear, speaking to the off-screen interviewer, seen against the out-of-focus background of the subway tunnel site. Only then could we complete our tasks in a timely manner and to a high standard, thereby ensuring the smooth running of the Xi'an subway line 4. High angle footage of the activity in the subway tunnel construction site. Close-up of Wu Long, wearing safety gear, speaking to the off-screen interviewer, seen against the out-of-focus background of the subway tunnel site. 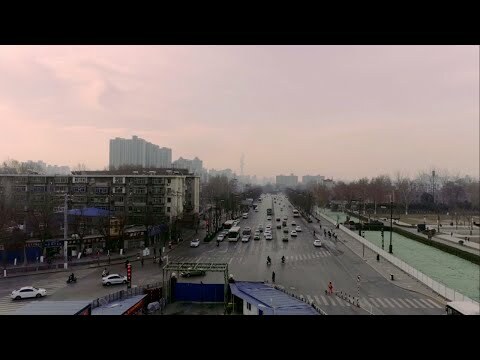 Bird’s eye view cityscape footage, from different angles, of Xi’an, with highways and train lines in the foreground, waterways and buildings and the city skyline in the background. Reverse view footage of people, including Tianlong, waiting in a subway station, as a train pulls in, and then boarding the train. Low angle close-up of an electronic information panel in the train. In China, Shell has established strong and strategic partnerships with many customers that are similar to China Railway. Close-up of Tianlong speaking to the off-screen interviewer, seen against an out-of-focus interior background. Front view footage of Tianlong and Wu Long walking along a paved area together, engaged in discussion, switching to reverse view slow motion footage of the same. Close-up of another two men engaged in discussion. Shell Pecten centred against a white background.